As you know, 200 years ago, in 1816, Basil Hall reached Okinawa. The following is from: Kinjō Hiroshi: Karate kara karate made (From karate 唐手 to karate 空手), 2011. Translation (incl. all possible mistakes) by Andreas Quast. To study the legacy and development of “karate”, within the extremely scarce historical records there is a precious clue to understand the state of affairs of the spread of Tōdī in Ryūkyū during the Bunka and Bunsei eras (1804–29). Namely, the “Account of a Voyage of Discovery to the West Coast of Corea, and the Great Loo-Choo Island” by Basil Hall, Captain of the Royal Navy’s warship Lyra, published in 1818. The book gives a summary of this voyage. 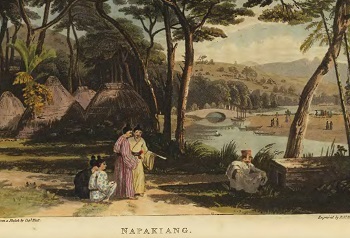 Napakiang, or Naha estuary, in “Account of a Voyage of Discovery to the West Coast of Corea, and the Great Loo-Choo Island” by Basil Hall. In autumn 1816 (Bunka 13), about half a century after the “Ōshima Hikki”, during the time of the 17th king Shō Kō of Ryūkyū, the British Royal Navy’s warships Alceste and Lyra reached Naha habor. During their stay of about forty days, they received the visit of a Ryūkyūan prince (Ōji), invited Ryūkyūans to a banquet, and besides it seems they were warmly welcomed by various Ryūkyūan government officials. On returning to the cabin to tea, they were all in high spirits, and while amusing themselves with a sort of wrestling game, Ookooma, who had seen us placing ourselves in sparring attitudes, threw himself suddenly into a boxer’s position of defence, assuming at the same time a fierceness of look which we had never before seen in any of them. The gentlemen to whom he addressed himself, thinking that Ookooma wished to spar, prepared to indulge him; but Madera’s quick eye saw what was going on, and by a word or two made him instantly resume his wonted sedateness. (Note by this blogger: Above I included the original text from Hall’s account. Kinjō Hiroshi quoted the Japanese translation taken from Haruna Akira, 1986). Ookooma (Okuma) and Madera (Maehira) were members of the Ryūkyūan officials who had received the invitation. Okuma, suddenly throwing himself “into a boxer’s position of defence,” was probably about to showcase a kata of Chinese kenpō. Utensils of daily life. 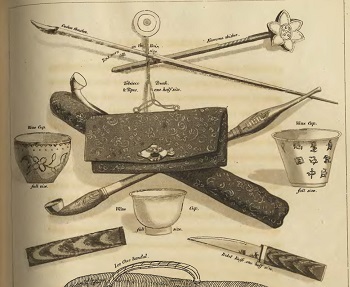 From “Account of a Voyage of Discovery to the West Coast of Corea, and the Great Loo-Choo Island” by Basil Hall. Because the British side presented their sparring of boxing, the Ryūkyūan side also would have wanted to showcase their kenpō similarly. But, as the matter happened spontaneously, it is believed that this led to a misunderstanding. From the fuss around Okuma it can be presumed that the kata of Chinese kenpō were spread considerably far and wide down to the common people during the Bunka era (1804–1818). (Note by this blogger: The point made by Kinjō, that kenpō spread down to the common people, is arguable, or at least the story of Basil Hall does not provide for such a conclusion. After all, Okuma was a government official specifically chosen for meeting and dealing with the foreigners. As such he was a typical exponent of old-style karate, but not a member of the class of the “common people”. This entry was posted in Unknown Ryukyu and tagged Basil Hall, boxing, Karate, Kinjo Hiroshi. Bookmark the permalink.